This is my first time trying Sachajuan hair care products. Thanks to Kens Apothecary for sending some Sachajuan Shampoo and Conditioner sachets and also the Sachajuan Hair Repair deluxe size sample. I have tried the three items all and I like the Sachajuan Hair Repair the most. Its an intensive hair treatment with Ocean Silk Technology for damaged and stressed hair, it promotes cell regeneration and lends vitality and strength. It helps to moisturize the end of my hair. I just apply and massage on washed hair, allow 5-10 minutes for the product to work in and then rinse off. My hair feels soft, sleek and moist. I like it because it makes my hair more manageable so styling my hair after wash is almost effortless. I am glad that it does not contain sulfates, synthetic dyes, petrochemicals, phthalates, GMOs and triclosan. Sachajuan Hair Repair has long lasting effect and ultra frizz reduction leave your hair manageable with a silky shine and a healthy look. 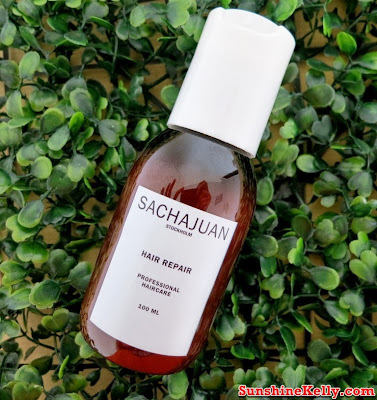 Sachajuan Hair Repair leaves hair so manageable that it makes styling the hair after wash almost effortless. Sachajuan Premium Hair Care is now available at Kensapothecary Bangsar Village II & One Utama. Sachajuan Professional Hair Care product line was created by high-end Swedish hairdressers Sacha Mitic and Juan Rosenlind, a range developed and produced in Sweden based on their extensive experiences as hair stylists in Sweden and internationally. Sachajuan Hair Repair, 250ml @ RM99 & 1000ml @ RM249.